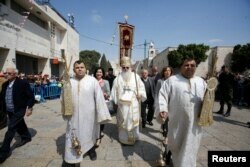 Latin Patriarch of Jerusalem Pierbattista Pizzaballa, center, walks with Christian clergymen holding candles during the Easter Sunday procession at the Church of the Holy Sepulchre in Jerusalem, April 16, 2017. Easter dawned in Jerusalem with a sunrise service at the Garden Tomb, where the faithful sang hymns of the resurrection. This holy site seeks to recreate the setting of the burial place of Jesus according to biblical accounts: “Now in the place where He was crucified there was a garden, and in the garden a new tomb in which no one had yet been laid” (John 19:41). A short time later, bells rang out in the narrow cobblestone alleyways of Jerusalem’s Old City, summoning worshippers to Easter Mass at the 4th century Church of the Holy Sepulcher. The atmosphere in the cavernous church was mystical. Priests in festive robes chanted the Easter liturgy, as a fragrant cloud of incense rose into a golden rotunda, symbolizing the glory of the resurrection. 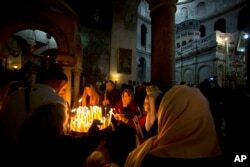 Christian pilgrims light candles during the Easter Sunday procession at the Church of the Holy Sepulchre, traditionally believed by many Christians to be the site of the crucifixion and burial of Jesus Christ, in Jerusalem, April 16, 2017. Pilgrims from all over the world gathered around the historic stone tomb believed to be the very place where Jesus rose from the dead. The ancient sepulcher has a fresh look: It was renovated for the first time in 200 years after the feuding denominations that control the site decided to bury their differences and allow the repairs in the name of Christian unity. People light candles as they celebrate the arrival of the 'Holy Fire' from Jerusalem's Holy Sepulchre outside the Church of the Nativity in the West Bank town of Bethlehem, April 15, 2017. Pilgrims came from all over the world to experience Resurrection Day in the city where, according to the New Testament, the events took place. 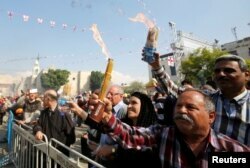 There were also groups of Arab Christians in town, including Israeli citizens from Jesus’ hometown of Nazareth and members of the Coptic Orthodox Church from Egypt. A week ago on Palm Sunday, ISIS militants blew up two churches in Egypt killing more than 40 people. The bombings, which were not the first, raised further questions about the safety and future of the dwindling Christian community in Egypt. 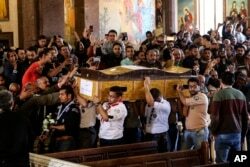 Men carry the coffin of a victim during the funeral for those killed in a Palm Sunday church attack in Alexandria Egypt, at the Mar Amina church, April 10, 2017. It was a big turnout this year because the Eastern Orthodox and Western churches, which use different calendars, celebrated Easter on the same day. The holiday was a multicultural experience, and not only because of the different Christian traditions. The head of the Greek Orthodox church in Bethlehem Bishop Theofilactos receives the 'Holy Fire' after its arrival from from Jerusalem's Holy Sepulchre, outside in the Church of the Nativity in the West Bank town of Bethlehem, April 15, 2017. The Old City was packed with Jewish pilgrims celebrating the weeklong holiday of Passover, one of three biblical Feasts of Pilgrimage; and the Christians and Jews mingled with the Palestinian Muslim shopkeepers in the Old City bazaar.